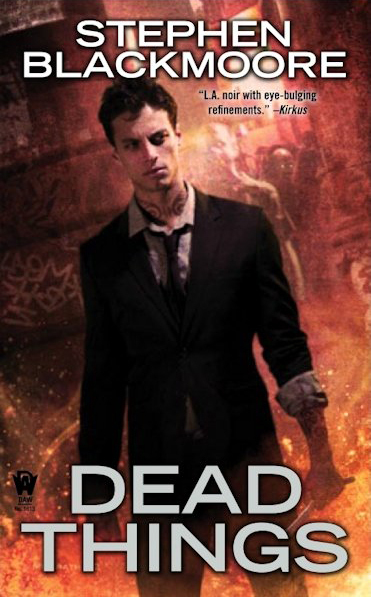 More horror than urban paranormal, Dead Things is a very dark tale about the price of going home again. Eric Carter has spent 15 years on the road trying to escape his past. A mobster of the magic-wielding sort, Jean Boudreau killed Eric’s parents, and in revenge, Eric killed him. Boudreau’s second-in-command, Ben Duncan, forced Eric to leave town to keep his loved ones safe. During his self-imposed exile, he’s been working as a sort of magical hired gun. We get a glimpse of this in the first chapter as Eric takes down a voodoo practitioner, who has managed to tie lesser Loa to his undead soul and wreck havoc across several States. Eric was hired by the Barons Samedi and Kriminel and Samedi’s wife, Maman Brigitte, to eliminate this threat. He tracks his quarry to an isolated West Texas bar and sees “a grim tableau that would make Hieronymus Bosch blush.” Eric takes out the fiend by animating a corpse, for yes, his magic is of the nature of dead things. Eric learns that his sister has been savagely murdered in Los Angeles, the very city he left so many years ago. He returns to L.A. and quickly learns how much the city and the people he left behind have changed in his absence. Determined to get answers about his sister’s murder, Eric heads to her house to talk to her. As a necromancer, he can see and talk to ghosts. However, the killer is smart even to leave nothing behind but an Echo and a message for Eric—that only he can see—welcoming him home. A note about the ghosts in the story … in this world, there are three kinds, Echoes, Haunts, and Wanderers. Echoes are merely that, an echo of the person’s last moments without any other awareness. Haunts are fixed to the locale where they died, and Wanderers are able to roam. Eric performs a ritual, using his blood, to attract wanderers for information. But they aren’t the only thing he attracts. Eric believes he’s been played, but he doesn’t have long to mull on it because two thugs taser him and bring them to their boss. Turns out Ben Duncan, now known as Griffin, is not happy Eric’s back in town and tries to kill him. This is where things start to get frustrating. Eric is able to extricate himself from Griffin’s clutches, but he is either beat up or ‘gets played’ by nearly everyone in town several more times. He tells us he was something like a supernatural hit man, but in L. A. it seems more like amateur, which he even he comments on at a couple points! True, psychologically he’s reeling from the trauma of his sister’s death, and he seems stuck in angry young man mode whereas his former friends have moved on with their lives and grown up. Still, it makes one wonder how he survived those fifteen years battling things like the voodoo practitioner from the first chapter. At one point, he makes a mistake so glaring that it doesn’t seem plausible. It gets someone killed, and he should have known better. Dead Things has a richly conceived mythology, and the story keeps your attention, despite a few frustrations with the main character. The dark themes may not be for all tastes. The narration does not hold back from gruesome descriptions. Necromancy is not glamorous. Santa Meurte is creepy scary. And don’t expect a sunny, happy ending. Recommended for fans of Stephen King or Dean Koontz who like their urban fantasiy novels dark.